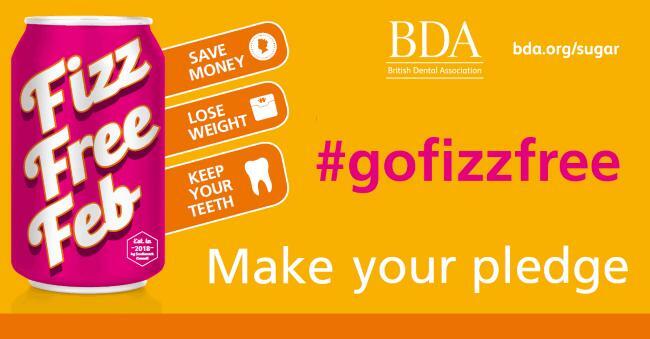 The BDA has thrown its support behind the Fizz Free February campaign, as it prepares to go national. Launched by Southwark Council in 2018, the campaign encourages the public to reduce their sugar intake by cutting out fizzy drinks. By committing to going fizz free for the entire month of February, supporters can develop new habits to make it easier to cut down on fizzy drinks for the rest of the year. BDA Chair Mick Armstrong said: “Prevention matters to us, because we see the damage fizzy drinks do every day. The sugar they are packed full of is a big contributor to the problem of obesity. But it is the single main cause of tooth decay. The idea behind Fizz Free February couldn’t be simpler: simply encourage families to take a few weeks out from reaching for a can of pop.